Some information like the messages you exchanged with friends may remain visible. Deleting your account may be delayed for a few days after you have made the request. This deletion request will be cancelled if you log into your Facebook account during this period of time. Deleting your data in the back-up system may take up to 90 days and for that reason, your information will not be accessible during this time. Some things are not stored in your account. For example, your friend may still have the messages you both shared after deletion of your account. Copies of some materials like your log records may still remain in Facebook's database but they are disassociated from personal identifiers. Click on the menu button at the top right hand of your Facebook page. On the pop up screen, scroll down to "Account settings"
On the pop-up screen, click on "General"
On the pop-up screen, tap on "Manage Account"
On the pop-up screen, tap on "Deactivate" at the right hand corner. Enter your password on the screen that pops up and tap on "Continue". 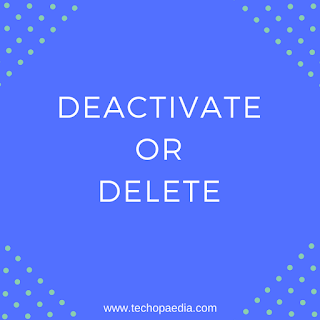 On the next page, you will be asked if you are sure of the decision to deactivate and to give reasons why you want to deactivate. After you have provided the necessary information, scroll down to the bottom of the page and tap on "Deactivate" to deactivate your account. You will once again be asked if you want to deactivate your Facebook account, tap on the "Deactivate" button to deactivate your Facebook account. Log in your Facebook account details. Click the account menu at the top right of your Facebook page. On the drop-down menu, select the “Settings” option. The screen that pops up shows your General Account settings, click on "Manage Account"
On the screen that drops down under Manage Account, scroll down to "Deactivate your Account"
At the bottom of the page, click on the "Deactivate your account" link. A new page will be open, where you need to enter your password. After entering your password, click on the "Continue" button. You’ll be directed to a new page, where you need to tell the reason behind your deactivation. After you've provided the needed information, click on the ‘Deactivate’ button for deactivation. Facebook will once again ask you to confirm your decision to deactivate Facebook account. Click on the "Deactivate Now" button to immediately deactivate your Facebook account. Click on the link at the bottom of the main menu that says "Download a copy of your Facebook data". After you have downloaded your data, all you need to do is visit this link: https://www.facebook.com/help/delete_account, click on "Delete my account", then follow the steps to confirm. If you run into any snags, do let us know in the comment box and we will help you untangle that knot.